This article is about an Irrigation tank. For other uses, see Tank (disambiguation). For etymology, see Storage tank. An irrigation tank or tank is an artificial reservoir of any size. They are mainly found in India. (The word sagar refers to a large lake, usually man-made). It can also have a natural or man-made spring included as part of a structure. Tanks are part of an ancient tradition of harvesting and preserving the local rainfall and water from streams and rivers for later use, primarily for agriculture and drinking water, but also for sacred bathing and ritual. Often a tank was constructed across a slope so to collect and store water by taking advantage of local mounds and depressions. Tank use is especially critical in parts of South India without perennial rainfall where water supply replenishment is dependent on a cycle of dry seasons alternating with monsoon seasons. Water is considered a purifying and regenerative element in India, and is an essential element of prayer and ritual. Water is also revered because of its scarcity in western India where dry and monsoon seasons alternate and failure of the monsoon season means famine and death while plentiful water replacing irrigations sources is a time of rejoicing. This resulted in building water storage tanks that combined the practical and sacred. Since ancient times, the design of water storage has been important in Indian architecture. As early as 3000 BC, sophisticated systems of drains, wells and tanks were built to conserve and utilise water. Tank building as an art form began with the Hindus and developed under Muslim rule. An example of the art of tank design is the large, geometically spectacular Stepped Tank at the Royal Center at the ruins of Vijayanagara, the capital of the Vijayanagara Empire, surrounding the modern town of Hampi. It is lined with green diorite and has no drain. The tank was filled by aqueduct. Ralegaon Siddhi is an example of a village that revitalised its ancient tank system. In 1975 the village was drought-stricken. The village tank could not hold water as the earthen embankment dam wall leaked. Work began with the percolation tank construction by the villagers who donated their labor to repair the embankment. Once this was fixed, the village's seven wells below the tank filled with water in the summer for the first time in memory. Now the village has a supply of water throughout the year. Tanks known as "Pushkarni" or "Kalyani" also known as "Kund" in Hindi are reservoirs with steps leading down to the water, generally found in South India, and sometimes constructed within the walls of a temple complex. Bathing in the sacred waters of a temple tank was believed to cure worshippers of afflictions such as leprosy and blindness. Many temple tanks are decaying and drying up today. Stepwells, also called bavdi (Hindi: बावड़ी) or bavli (Hindi: बावली), are wells in which the water can be reached by descending a set of steps. They are most common in the west of India. Stepwells were often used for leisure, providing relief from daytime heat. This led to the building of some significant ornamental and architectural features, often associated with dwellings and in urban areas. It also ensured their survival as monuments. The development of large-scale water management methods and hydroelectric generation have replaced much of the local efforts and community management of water. 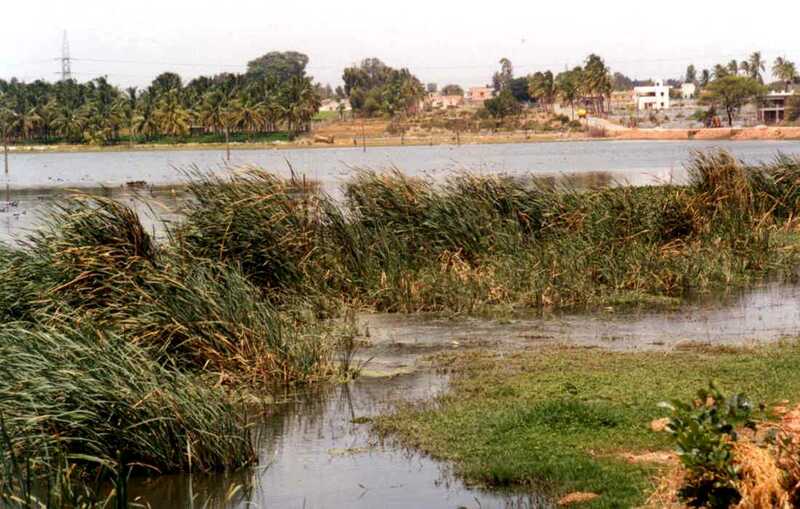 For example, the state of Karnataka has about 44,000 artificial wetlands locally constructed over many centuries. At least 328 are threatened today. However, recently a tank regeneration movement initiated by communities and non-governmental organisations (NGO) has arisen. Today, there are approximately 120,000 small-scale tanks, irrigating about 41,200 km² in semi-arid areas of India. This constitutes about one third of the total irrigated land in South India. ^ "Architecture on the Indian Subcontinent - glossary". Retrieved 2006-12-18. ^ a b "Tank management". rainwaterharvesting.org. Retrieved 2006-10-17. ^ Thapar, Binda (2004). Introduction to Indian Architecture. Singapore: Periplus Editions. p. 24. ISBN 978-0-7946-0011-2. ^ "Architecture - Stepwells". Retrieved 2007-01-09. ^ "Great Tank". art-and-archaeology. Retrieved 2007-01-13. ^ "Ralegan Siddhi : A village Transformed". Retrieved 2006-10-30. ^ "Architecture of the Indian Subcontinent - glossary". Indian Architecture. Retrieved 2006-10-17. ^ "Sun Temples in India". TempleNet. Retrieved 2006-10-17. ^ "Ponds, tanks relics of a bygone era". AmritsarPlus Online Edition. Retrieved 2006-10-17. 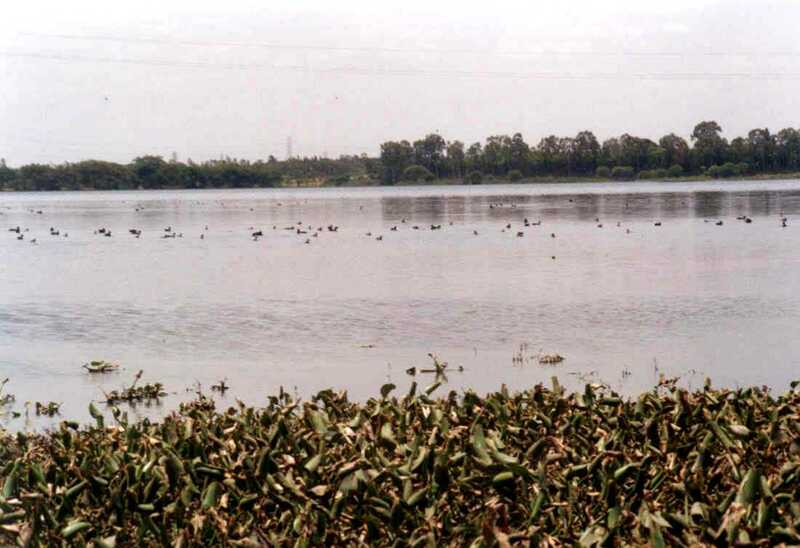 ^ "Bird monitoring at Rampura and Kalkere tanks". aroche.org. Retrieved 2006-10-17. ^ Anbumozhi, V.; Matsumoto, K.; Yamaji, E. (2001). "Towards Improved Performance of Irrigation Tanks in Semi-Arid Regions of India: Modernization Opportunities and Challenges". Irrigation and Drainage Systems. 15 (4): 293–309. doi:10.1023/A:1014420822465. INIST:13552012. ^ Arumugam, N.; Mohan, S.; Ramaprasad, R. (1997). "Sustainable Development and Management of Tank Irrigation Systems in South India". Water International. 22 (2): 90–7. doi:10.1080/02508069708686676. INIST:2829920. Palanisami, K, and Easer, E.W. (2000). Tank Irrigation in the 21st Century—What Next? Discovery, Delhi, Discovery. ISBN 81-7141-558-X.